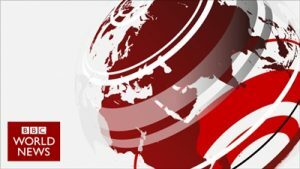 The BBC is in talks with Irish and Dutch authorities to obtain licenses allowing it to continue broadcasting across the European Union in the event of a no-deal Brexit, according to two people familiar with the matter. The U.K. licenses that the taxpayer-funded British Broadcasting Corp. uses to beam hit shows including nature documentary “Blue Planet 2,’’ “Top Gear’’ and its World News channel into other EU countries will no longer be valid unless the U.K. leaves the bloc on March 29 with a withdrawal agreement in place. British businesses are bracing for the growing possibility that it won’t be. Prime Minister Theresa May is struggling to get Parliament to support her deal with the EU that would prolong current broadcast licensing arrangements for two years while Britain negotiates a new relationship with its biggest trading partner. On Tuesday, May’s Cabinet agreed to step up preparations for a no-deal Brexit. International media companies that have regional hubs in Britain, such as Discovery Inc. and Comcast Corp.’s NBC Universal, have also applied for broadcast licences elsewhere in the EU to safeguard the transmission of their channels on the continent. The Irish regulator BAI said it had a similar licensing regime to Ofcom in the U.K. and had “been engaging with a number of UK-based broadcasters who are exploring Ireland, and a number of other EU member states, as a potential licensing jurisdiction in which to base their EU broadcasting services.” A representative of the Dutch media regulator had no immediate comment. The U.K. is the broadcasting hub of Europe, home to more channels than any other EU member state. International media companies collectively spend about 1 billion pounds ($1.26 billion) annually in the U.K. on things like content, production facilities and technology, according to research by media analysis firm Oliver & Ohlbaum commissioned by the Commercial Broadcasters Association lobby group. Through its commercial arm BBC Studios, the BBC makes some channels available elsewhere in the EU, such as BBC Entertainment, which carries re-runs of shows such as sci-fi hit “Doctor Who,” “Bargain Hunt” and “Antiques Roadshow.” The BBC generates hundreds of millions of pounds of revenue from EU markets, according to the U.K.’s telecommunication regulator Ofcom. Adam Minns, executive director at the Commercial Broadcasters Association, said the expansion of international channels has been one of the biggest drivers of economic growth and employment in the U.K. television industry. “But going forward, if the U.K. cannot grant an international channel a broadcasting license that is recognized by other countries, it is going to be very hard to sustain that growth in the medium to long-term,” said Minns, who declined to comment on the BBC’s situation.